That’s an expression I’ve always used; seems to me I first heard it said as a kid in Texas. Much later, in Naples, Florida, some of my friends and I culminated our series of bands with a lineup of John Klingler and Don Spicer on guitars, Mike Collins on drums, and yours truly on bass. We all contributed vocals and other folks came and went as time went on. We called the band Boy Howdy and we played rock, blues, Dylan, Cream, Allman Brothers and Mountain covers and whatever else we could handle. We played the Naples Teen Center and some parties, but our regular gig was at Al Bolton’s Aquarium Bar on the Trail in East Naples, so named because he had a couple of large built-in freshwater aquariums with a giant Oscar fish in each. The clientele was an uneasy combination of migrant workers, kids and bikers. Sometimes fights broke out and the bouncer, a gentle giant named Pabst, would settle things by falling on the miscreants like a felled oak tree. The bar was in an old Quonset hut but the acoustics were good. We played a couple of nights a week. The Boy Howdy Band, or part of it, is shown in this photo recently sent to me by my still-best friend, John Klingler. 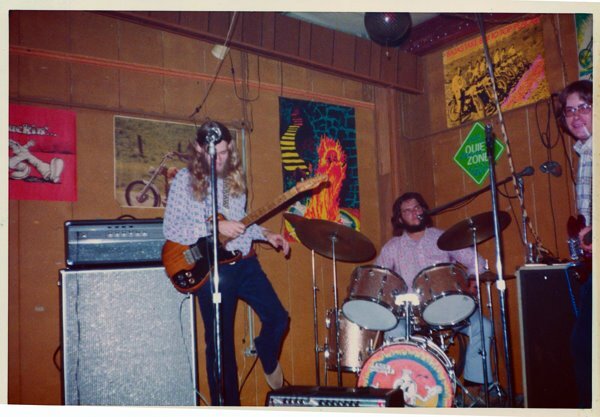 He’s the one on the left in this photo, the drummer is Mike Collins, and I’m on the right on bass, with a cigarette hanging out of my mouth! John’s sister, Jean, found the photo somewhere. Taken on the evening of June 9, 1973 as we celebrated John’s 21st birthday; notice the Boy Howdy drumhead and period posters!!! That’s why the Robert Crumb-created Boy Howdy figure is at the top of this blog. We saw that drawing as the mascot for Creem magazine and decided we’d use it, too.